Apollo’s Hegemony Digestive Support is a dietary supplement which contains 150 mg of milk thistle extract, 45 mg of papain and 100 mg of pepper extract in a single serving. Milk thistle – an annual plant from the Asteraceae family. Its healing properties have been already known in anciet times and the Middle Ages. It is rich in silymarin, the main active component, which is a complex of flavonolignans – silybins, isosilybins, silychristines and silydianins. Silymarin is commonly used as an ingredient of many dietary supplements aiming at liver support. Other active components of milk thistle are silyhermin, neosilyhermin A and B, quercetin, kaempferol, apigenin and many other valuable substances. Supplements containing milk thistle show anti-inflammatory, antioxidant and detoxifying properties as well as accelerate the regeneration of liver cells. They can also stabilize cell membranes, regulate lipid profile and positively affect skin condition in people with acne. Papain – a proteolitic enzyme, consisting of 212 amino acid residues, present mainly in papayas. It breaks down proteins by tearing the bonds between amino acids. Its action is similar to pepsin; its acts in the slightly acidic environment of the stomach. It is valued because of its antiparasitic properties, because it can digest some parts of parasites bodies. It can also break down the protein structure of cell walls and membranes of bacteria and fungi. Pepper extract – pepper is one of the most popular seasoning, commonly used because of its bitter-spicy, hot flavour. The main active substance in pepper is an alkaloid, piperine, which has many beneficial properties affecting our body system. Piperine is known especially for its interaction with particular enzymes, which is why it improves absorption of many nutrients. It can also improve digestion and increase thermogenic processes as well as improve neurotransmission of serotonin and dopamine. Other active substances of pepper include pellotine, guanosine, trichostatin and piperonal. Milk thistle is one of the basic and the most popular substances supporting the liver, an organ responsible for detoxification. The plant is useful in both prevention and support of the regeneration after damage. As a preventive measure, it can be used in case of exposure to environmental toxins, for example during work in factories using harmful chemicals or after alcohol consumption. One of the protective mechanisms is the antioxidant effect of silybinin, which raises the levels of key enzymes neutralizing oxygen free radicals. The use of milk thistle can improve the synthesis of structural proteins forming hepatocytes, which results in a regenerating potential in case of many liver diseases. It is commonly applied in case of alcoholic and non-alcoholic fatty liver, liver cirrhosis, cholelithiasis and bile ducts inflammations. The common saying says that we are what we eat. Nowadays, it is rather believed that we are what we digest. Efficient digestion is crucial if we want to enjoy beneficial properties of food we are consuming. Thanks to the presence of papain, we can obtain better digestion of protein at stomach level, so that we absorb greater amounts of amino acids which can be used for the formation of structural proteins, enzymes and peptic hormones. Piperine from pepper can stimulate the production of gastric juices, probably due to the agonism of histamine receptors H2 in stomach cells. Another positive aspect of pepper consumption is slower emptying of the stomach and a slow down in intestinal peristaltis, so that the body system can digest the food more effectively, as it moves slower through the digestive system. Milk thistle is also involved in the regulation of digestion, mainly due to its cholagogic and cholepoietic properties which support fat digestion. Silymarin can protect stomach mucosa, which reduces the ailments of people complaining about poor condition of this organ. This property will be particularly interesting for people who want to stop fat accumulation. Silybinin, the main component of silymarin, can inhibit fat cells proliferation and accumulation of triglycerides. It can also reduce the transport of glucose to cells by GLUT4. Also piperine supports the supplement ability to inhibit fat accumulation. This action results from the ability to inhibit the expression of genes responsible for the formation of new fat cells. Moreover, it can also reduce the level of lipids circulating in blood. 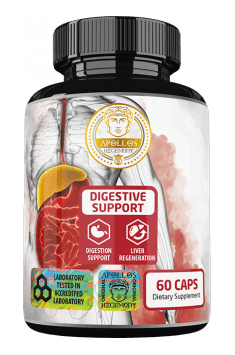 Apollo’s Hegemony Digestive Support is recommended especially for people who want to support digestion and the liver in fight against toxins as well as accelerate its regeneration. It can serve as a support for general health, thanks to antioxidant and anti-inflammatory properties. As a dietary supplement, take 2 capsules a day, with a meal. The supplement will be perfect in improving digestion, as a support for liver regeneration or as a preventive measure. The best effects can be achieved by taking supplement portion with a meal containing fats and proteins for two reasons. The first one is the potentially better absorption of components insoluble in water, especially those contained in milk thistle. The second one is more efficient digestion of proteins in the stomach and fats in the small intestine. Because of the ability to support digestion, a meal should be as big as possible. For better results, it is recommended to use the supplement for a longer period of time, at least for one month or even for a half of a year.